Its purple running surface makes new Elmer Gray Stadium easy to spot in this aerial image from late January. Powell Fitness Center and the original Gray Stadium can be seen at top right. Between the new stadium and Wells Field (home of Wildcat softball) are field houses for track and field (left) and softball/soccer. Ambler Avenue is to the north and Campus Court is on the west. Keith Barnier may not sleep well April 10, the night before Abilene Christian University hosts TCU and Texas Tech University in the biggest triangular track and field meet in ACU in more than half a century, but it will have nothing to do with the purple – and fast – running surface at new Elmer Gray Stadium. Unlike his predecessors prior to the late 1960s, no Wildcat head coach today need lose a minute of shuteye obsessing over the grooming of a porous cinder track on which his team would have to compete before the next nightfall. 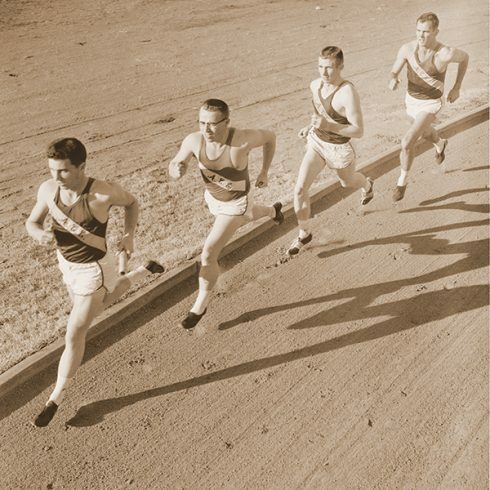 Waymond Griggs (’59), Bill Woodhouse (’59), James Segrest (’59) and Bobby Morrow (’58) practiced and competed on Elmer Gray Stadium’s cinder track, and together tied or set four world records in the 440-yard relay. Running surfaces have come a long way since former head coaches Oliver Jackson (’42) and Bill McClure (’48) used a tractor to drag a heavy wooden implement behind it, water the surface, and then roll and pack it smooth in an effort to outfox the dry West Texas wind and drain downpours that could otherwise turn a fast track into a mushy quaqmire. 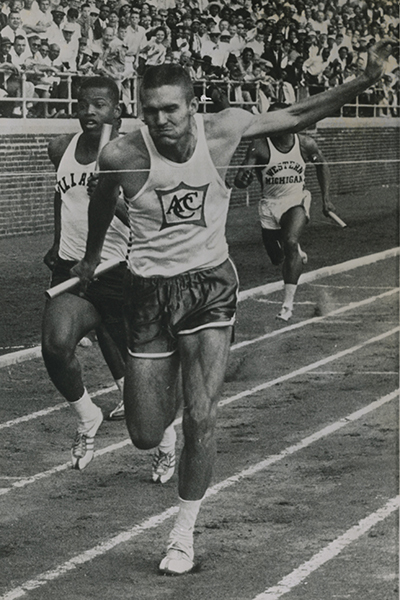 ACU upsets Villanova University at the 1962 Penn Relays as Earl Young beats Frank Budd at the finish line of the 4×400-yard relay, run on a cinder track. To underscore the advantage today’s modern surfaces give runners, consider that Philadelphia’s legendary annual Penn Relays – held for the first time in 1895 – saw a six-second improvement in the college division’s 4×400 relay winning time after switching from a cinder to all-weather track in 1967. 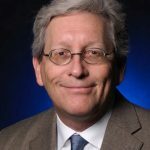 Young said that without such care – and good drainage in wet conditions – cinder tracks could become crusty, hard or loose, and create inconsistent conditions for athletes. “I always preferred a well-maintained surface because it was easier on my legs. It had some ‘give’ to it,” Young said. Conder said lane lines on cinder tracks had to continually be re-chalked when blurred by wind or rain. 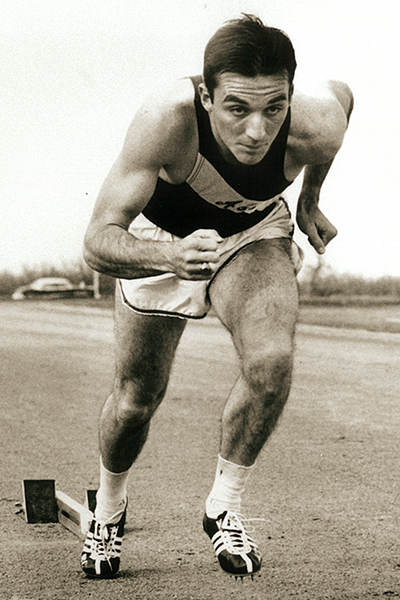 ACU sprint sensation Bobby Morrow (’58) ran a 9.1-second wind-aided time in the 100-yard dash in June 1955 at the NAIA national championships at McMurry College, set on what Conder called a very loose cinder track. Morrow was a freshman that season who helped his team win its third national title in four years. That the Wildcat sprinter could perform so splendidly on a slow running surface – 9.1 in 1955 would have been a world record under today’s wind restrictions – makes fans of the sport shake their heads in amazement. 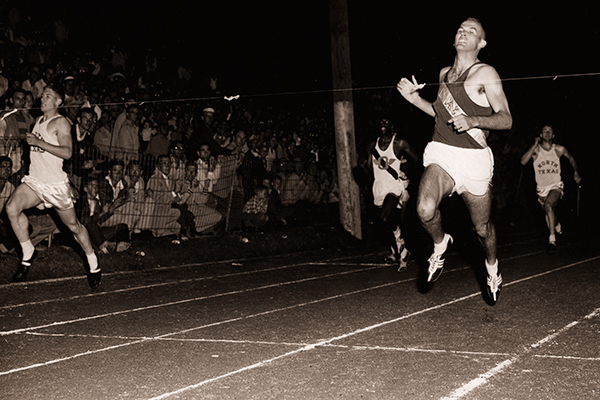 Morrow (right) breaks the finish line tape at a race on a cinder track in 1956. Morrow became known as the world’s fastest man after tying or setting nine world sprint records and winning three gold medals in the 1956 Olympics in Melbourne, Australia. “I have always wondered what times he and we may have run if we had the type surfaces they have now,” Conder said. Both the 100-meter (won by Donovan Bailey) and 200-meter (Michael Johnson) dashes in Atlanta resulted in new world records. Johnson also added a gold medal in the 400. Don Conder ran on an 880-yard Wildcat relay team with Woodhouse, Segrest and Morrow that tied a world record in 1956. The last Olympics to be held on cinder were the 1964 games in Tokyo, Japan. 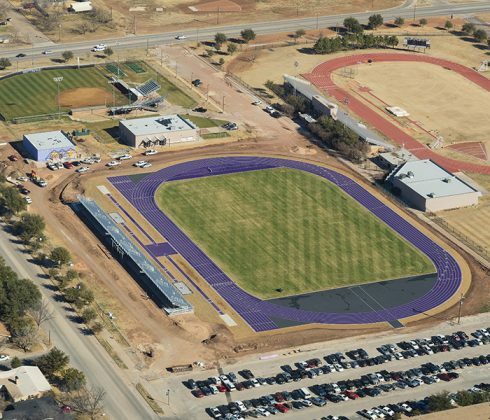 ACU’s old Elmer Gray Stadium track was converted from cinder to an all-weather surface in 1969, thanks to a gift from the Gray family. The surface was re-done in 1978 and renovated again in 1990. The new Elmer Gray Stadium running surface is a world-class, full-pour polyurethane product built by Beynon, a Maryland-based company that installed identical tracks at Big Ten Conference universities Michigan, Wisconsin and Iowa; and Duke, North Carolina, Wake Forest and North Carolina State of the Atlantic Coast Conference, among others. Beynon tracks can be found throughout the Big 12, Big 10, Pac 12, Southeastern and Atlantic Coast conferences. The last two U.S. Olympic trials (2008 and 2012) were held on a Beynon track at historic Hayward Field at the University of Oregon in Eugene, Ore., and will be again in 2016. A cinder track today at the Penn Relays would likely never hold up like a synthetic one, as the three-day track and field carnival attracts 22,000 runners in various events. Averaging more than 44,000 spectators a day, only the Olympics and world championships draw larger crowds. Morrow runs 9.3 in the 100-yard dash to beat a Texas Relays field of Longhorn, Baylor and ACU sprinters in Austin in 1957 on the cinder track at Memorial Stadium. Wildcat runners swept the 100 dash at the Texas Relays from 1955-58. 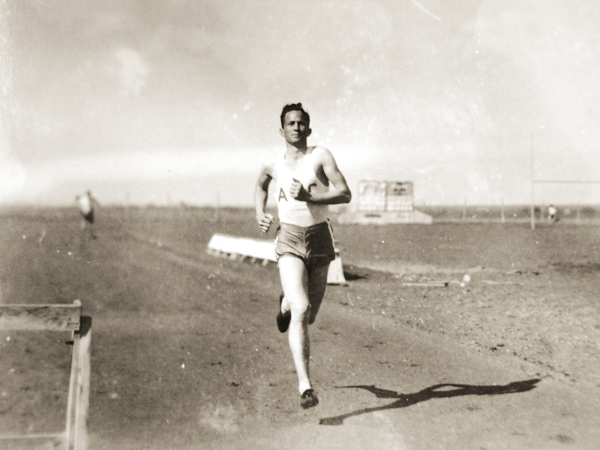 Elmer Womack (’41) sprints on the dirt track at old A.B. Morris Stadium, the forerunner of Elmer Gray Stadium. The Wildcat track and field and football teams used the facility, which is approximately where today’s Mabee Business Building is located.